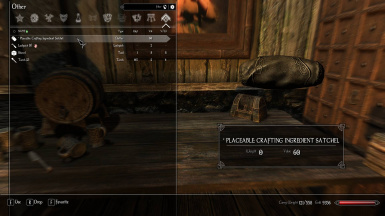 Adds a housing placeable satchel that can be used to withdraw or deposit types of crafting ingredients easily. Uses master secure storage for container. Same as 1.1. Actually forgot to pack the new ESP. Forgot to include a modified vanilla scipt file. Implemented a fix for a bug in Enderal's esm preventing placement of items in the noble house. I haven't played Enderal in a while and not since the major housing overhaul in Enderal patch 1.1.5.9. 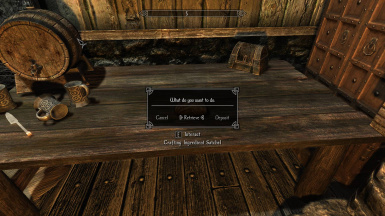 This mod may be broken and could possibly break your saves. Make sure you have backups of your saves before using. If you have tried it on a newer patch version let me know if it does or does not work. It should work with the German version of the mod, however all the messages in this mod are in English. 1.2 Fix for placement in noble house (Enderal bug). Also included patched Enderal script to allow placement in general. 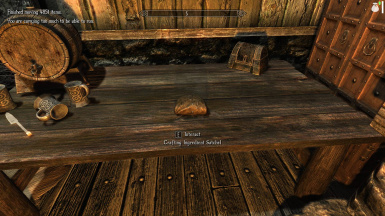 Adds a housing placeable satchel that can be used to withdraw or deposit types of crafting ingredients easily. It will transfer all Enderal vanilla materials of the types listed. It does not support anything added by other mods. It uses the Secure Storage container for storing your items. So you can still access them when you're not home. Gives a 2 minute (2000) carry weight bonus so you can carry around your ridiculous amount of materials. Some might call it a cheat because of the carry weight bonus. It's only 2 minutes. Chances are it'll wear off before you finish whatever crafting you were doing. Use your favorite mod manager to install. If asked to overwrite script files, say yes. Purchase the "Blueprint: Crafting Ingredient Satchel" from Samael Silren in the Ark Bank or Gabor Gaboff in Gaboff's Premium Wares - Nobles Quarter. Craft the MISC item to be dropped in the housing of your choice. Materials required: 2 Leather, 1 Leather Strip, 2 Spare Parts. Enter your house and drop the MISC item to start the placement functions. Place wherever you like. Use the activation key to enter the menu of the satchel. You can choose to either retrieve or deposit items. From there you can choose which category of items. After selection you will see a message stating it's starting to move the items. Upon completion of moving you will get an additional notice stating how many items were transferred. You will also receive a carry weight boost that lasts 2 minutes. This is to allow you time to get from your housing to a crafting station. If you have a really large amount of items, the carry weight bonus may not be enough to prevent you from still being overencumbered. Will conflict with other mods that also modify the shop containers for the listed 2 NPC's. Specific containers are: _00E_Merchant_CCGaboff "Chest" [CONT:0013CA58] and _00E_Merchant_CCSamaelSilren "Chest" [CONT:00141554]. If you update Enderal you may be required to re-install this mod to overwrite the modified script file. This only affects placement of a new satchel. An existing satchel will continue to work regardless. Nothing more currently. Suggestions welcome. Demands are not. coming when I have content to post.